OCTOBER 2016, HIGH POINT, NC – With the introduction of the Palms Collection at the High Point Market, Marge Carson reaches back to its California casual roots to create a fresh and current contemporary style inspired by the natural environment. Capturing the beauty of rugged coastlines, remote beaches and serene deserts, Palms celebrates organic motifs, textured surfaces and mixed materials. Palms is crafted of environmentally-friendly tropical plantation-grown raffia and rift-cut American White Oak that is softly wire-brushed to enhance the character of the wood grain and blend with the texture of the woven raffia. All 33 pieces of the collection are available in three relaxed, tactile finishes including Dapple, a light grayed-beige; Saddle, a medium honey brown and Dark Bay, a rustic dark brown with black mottling. In Palms, organic inspiration is front and center with such touches as an intricate twig design that serves as the body of several pieces, the basket-weave veneer pattern on striking dining table tops, woven rattan accents on case pieces and upholstery and a wavy swirl pattern in the cast brass hardware that brings to mind wind-blown sand or ripples of water. “With Palms, people will be reminded of the look and scale of the California casual style Marge Carson made famous, updated for today in the texturing of materials such as wire-brushed oak to give a more relaxed and casual feeling and to draw out the beauty of the natural materials,” said Tom Tilley, director of wood products for Marge Carson. Along with the organic motifs, natural materials and textures, another signature element of the collection is its striking, sculptural cast-brass hardware. “The custom hardware has dramatic artistic impact,” Tilley said. There are three distinct types of hardware: simple bar pulls crafted from solid brass with raffia-inspired couplings; sculptured solid brass panels framed in solid oak featuring a swirling wave-like pattern, and a half-inch-thick clear glass bar mounted over a brass substrate with a raffia-like texture. The light gray-beige Dapple finish is accented by woven raffia and highly- textured fabrics for a coastal feel. The rustic dark brown Dark Bay finish takes a casual urban direction. Raffia accents are not present in this look, which would easily work in more metropolitan settings, as well as the coast or a resort area. In this look, the Saddle finish is mixed with the Dark Bay and raffia, along with many mixed materials for a more universal casual contemporary look. “In Palms, the mixture of natural materials comes together to create a backdrop that would be at home with a variety of accessories ranging from Oriental to transitional to Arts and Crafts to casual contemporary,” Tilley said. 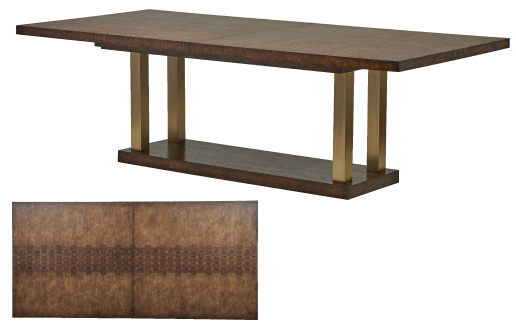 A dramatic basket-weave pattern in a contrasting walnut veneer adorns the top of the oak rectangular dining table and laps over the edges. The table top is supported by stainless steel posts available in three different finishes to complement the wood finish of the top and base. 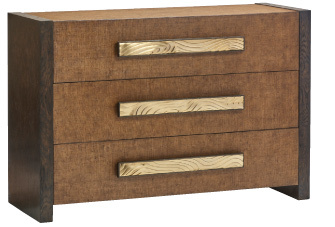 The 3-door, 72” credenza is a perfect example of California Casual styling with an organic twist. The classic box- on- stand form features three raffia-covered doors, showcasing the relaxed, natural beauty of this environmentally friendly material which is woven from Philippine palm trees. The casual simplicity of the case form is contrasted by the unexpected sculptural impact of cast solid brass panels framed in solid oak. 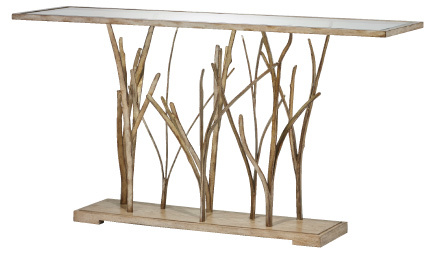 This piece can be used in a contemporary dining environment or as a beautiful entertainment center. 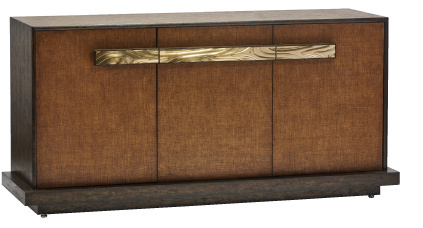 The console is one of five accent pieces in Palms that features an organic, interlocking twigs design. The twigs are made out of stainless steel in an exacting specification to support the glass top and are mounted to an oak veneered base. The twigs are available in two different finishes, a satin brass color and a silver color. Projecting a tactile character and appeal, the drawer fronts and top of the three-drawer chest are covered in raffia, while the side panels are in wire-brushed oak. The solid brass hardware, running horizontally across each of the three drawers, has a sculptured surface in a wave-like, swirling pattern. 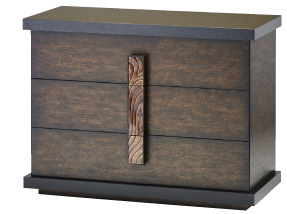 The case of this three-drawer nightstand is in oak, and the top is in striking black granite. The generously-scaled bar-shaped hardware runs vertically up and down the case, with a sculptured, wavy surface and a dark finish to complement the color of the granite top and base molding. The nine piece sectional is a texture story, with woven rattan arms and base contrasting with a natural weave body fabric and linen pillows appliqued with a naturalistic leaf pattern. Generously-scaled block arms and a textured Italian woven rattan in an ivory color form the sectional silhouette. The cotton body fabric, Sunburst Oatmeal, contrasts with the Savvy Natural pillow fabric in a natural-colored linen appliqued with a leaf pattern and outlined in embroidery stitching.  Another pillow fabric, Klimp Snow, is in a herringbone ivory. A more modern version of the quintessential over-scaled Marge Carson sofa, Mila is an all-over tufted sofa with a curved, exposed wood frame with beading on each side of the frame. Orleans is the main wood finish, accented by Versailles, a silver leaf bronze glaze. The body fabric is the boucle Sorcerer Sand, while the Elevate Mocca pillows are contemporized damask in a pale cinnamon accented with gray and gold metallic threads. Channeled all over, inside and out, Amelia is a straight-line silhouette with oval-shaped panel arms accentuated by nailheads. 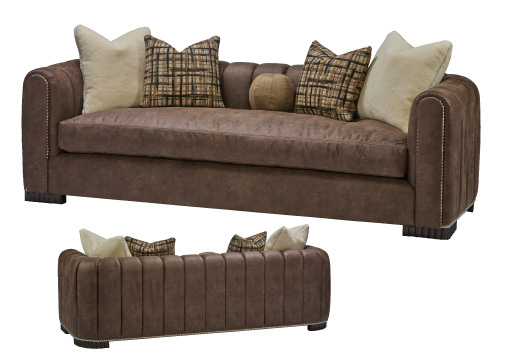 A distressed leather material called Aviator Brown is the body cover, accented with Appalachian Lamb pillows in an eco-friendly woven wool, and Zorro Cross Hatch, a contemporized plaid. In a creative and functional silhouette, two one-armed gallery chaises are connected with a table on casters that slides back and forth between them. The chaise can go in either direction, creating either a sofa or tete-a-tete silhouette. The Diplomat Micah body fabric is chenille with a lightly dusted gold glaze. The Noble Crock pillows are in chenille in a multi-colored metallic embossed, iridescent crocodile print.